Brasilia National Park and Igrejinha N.S. De Fatima church are good opportunities to explore the local culture. Get some historical perspective at Catedral Metropolitana and Ermida Dom Bosco. Explore Brasilia's surroundings by going to Luziania (Clube Pescar & Igreja de Nossa Senhora do Rosario), Valparaiso Cultural Space (in Valparaiso De Goias) and Pireneus Vinhos e Vinhedos (in Cocalzinho de Goias). Spend the 10th (Sat) exploring nature at Chapada Imperial. 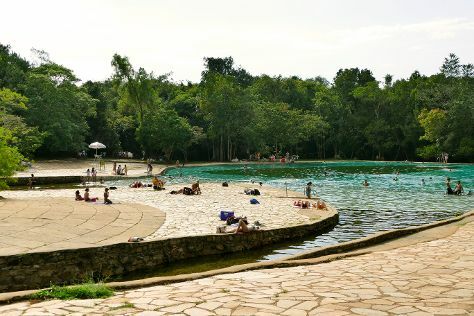 There's still lots to do: identify plant and animal life at Parque Olhos D'agua, ponder the design of Fonte Da Torre de TV, take in the waterfront at Pontao do Lago Sul, and admire the natural beauty at Jardim Botanico de Brasilia. To find traveler tips, maps, photos, and more tourist information, you can read our Brasilia travel itinerary planner . If you are flying in from United States, the closest major airport is Presidente Juscelino Kubistschek International Airport. In November, daily temperatures in Brasilia can reach 83°F, while at night they dip to 66°F. Finish your sightseeing early on the 30th (Fri) so you can travel back home.